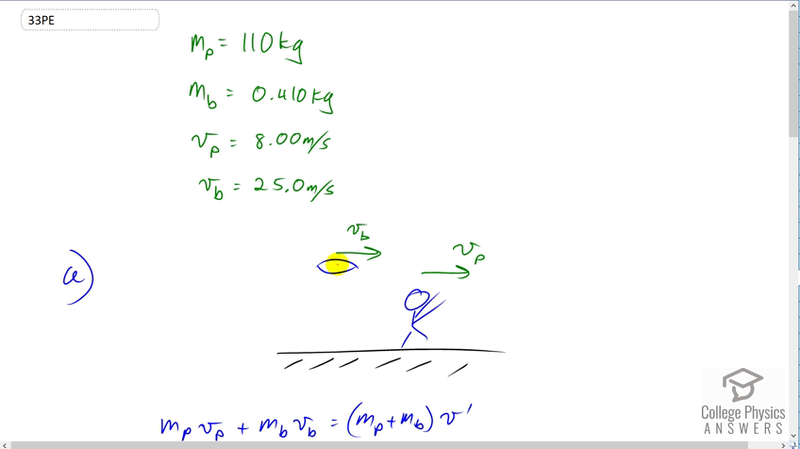 Using mass and speed data from Example 8.1 and assuming that the football player catches the ball with his feet off the ground with both of them moving horizontally, calculate: (a) the final velocity if the ball and player are going in the same direction and (b) the loss of kinetic energy in this case. (c) Repeat parts (a) and (b) for the situation in which the ball and the player are going in opposite directions. Might the loss of kinetic energy be related to how much it hurts to catch the pass? This is College Physics Answers with Shaun Dychko. In part A we have the football player running in the same direction as the ball. The ball of course is going faster at 25 meters per second so it's catching up to the player and he's going to catch it. The player is moving to the right with eight meters per second velocity. We'll take right to be the positive direction. The player's mass is one hundred and ten kilograms and that of the ball is 0.41 kilograms and we need to figure out what will the speed of the ball and player be when the player catches the ball. So because the ball and player are going to stick together after the collision, this is a perfectly inelastic collision. So we have the total momentum before collision, mass of the player times velocity of the player plus mass of the ball times velocity of the ball, all before collision. That total momentum has to equal the total momentum after the collision which is the total mass of the player and ball stuck together multiplied by their common speed or velocity which is v prime. Now we can solve for v prime by dividing by the sum of their masses, both sides. That cancels on the right side and then we switch the sides around. We get v prime is mp vp plus mb vb all divided by mp plus mb. So we've 110 kilograms times eight meters per second for the player plus 0.41 kilograms times 25 meters per second that's momentum of the ball, and divided by the total mass. This gives 8.06 meters per second will be the velocity of the player after he catches the ball. The change in kinetic energy is the difference between the final kinetic energy and the initial kinetic energy. The final kinetic energy will be one half times the combined mass of the player and ball multiplied by their speed v prime squared. Then from that we subtract the total kinetic energy of the player and ball separately before the collision. So we have one half times 110 plus 0.41 kilograms, times 8.0631 meters per second and that is squared, then subtract from that one half times 110 kilograms times eight meters per second squared, plus one half times 0.41 kilograms times 25 meters per second squared. This gives a change in kinetic energy of negative 59.1 joules. So some kinetic energy was lost in this collision which is what always happens in perfectly inelastic collisions or any inelastic collision. Now in part C we're meant to answer the two questions that we answered in part A and B again but this time with the player running in the opposite direction to the ball. So the only difference is that this initial player velocity will be negative eight meters per second. It'll have to have the opposite sign that it had before. So the player in part C, is now going to be going this direction for part C. So the final velocity after he catches the ball will be negative 7.88 meters per second. The change in kinetic energy, it's going to be the exact same numbers that we had up here with the exception that the velocity after the collision will be different. Otherwise everything else that's here is the same and we end up with negative 222 joules, that's the amount of kinetic energy that's lost. So, yeah, it would -- all those kinetic energy gets turned into heat in the player's muscles, and sound too, I suppose. So when running towards the ball, it's going to hurt more to catch it because that's also you know, going to be reflected in the amount of pain one experiences as the amount of energy dissipated by the body compared to when running in the same direction as the ball, less energy is dissipated.